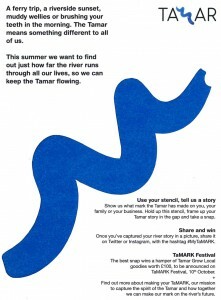 What does the Tamar mean to you? A ferry trip, a riverside sunset, muddy wellies or brushing your teeth in the morning. The Tamar means something different to all of us. This summer we want to find out just how far the river runs through all our lives, so we can keep the Tamar flowing. Once you’ve captured your river story in a picture, share it on Twitter or Instagram, with the hashtag #MyTaMARK or email it to lucy@my-tamar.org. On TaMARK Day (10th October 2015 at Cotehele Quay) the best snap will win a hamper of Tamar Grow Local goodies worth £100. You can see the TaMARKs already submitted by checking the website or following us on Twitter (@WestcountryRT #MyTaMARK or #MyTamar) or on Instragram (@My_Tamar).